Can the magic be recaptured with a major cast change? Has the Lethal Weapon TV show been cancelled or renewed for a fourth season on FOX? The television vulture is watching for the latest cancellation and renewal news, so this page is the place to track the status of Lethal Weapon, season four. Bookmark it, or subscribe for the latest updates. Remember, the television vulture is watching your shows. Are you? 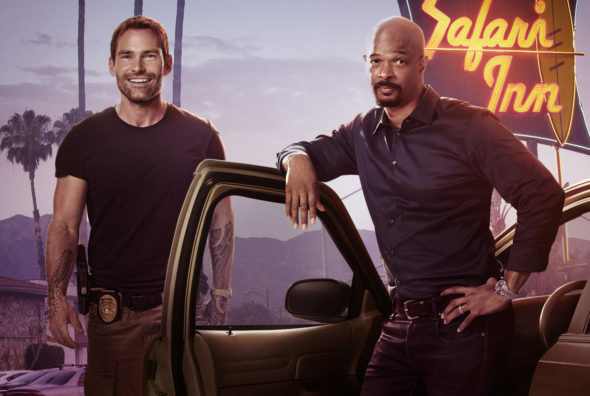 Airing on the FOX television network, Lethal Weapon stars Damon Wayans, Seann William Scott, Kevin Rahm, Johnathan Fernandez, Michelle Mitchenor, Keesha Sharp, Dante Brown, and Chandler Kinney. The series follows Detective Roger Murtaugh (Wayans), his LAPD colleagues, and his family at home. After a tragedy, Murtaugh is partnered with Detective Wesley Cole (Scott), a former CIA operative who’s been everywhere and seen everything. How long will it take him to adjust to Los Angeles? The third season of Lethal Weapon on FOX averaged a 0.70 rating in the 18-49 demographic and 3.06 million viewers. Compared to season two, that’s down by 29% and 26%, respectively. Find out how Lethal Weapon stacks up against the other FOX TV shows. As of April 23, 2019, Lethal Weapon has not been cancelled or renewed for a fourth season. Stay tuned for further updates. Coupled with the low ratings and Wayans’ possible departure, I think that season three will be the end. FOX seems to be open to more so, we’ll see. I’ll update this page with breaking developments. Subscribe for free Lethal Weapon cancellation and renewal alerts. TV show ratings are still important. Follow Lethal Weapon weekly ups and downs. Find more Lethal Weapon TV series news or other FOX TV show news. What do you think? Do you hope the Lethal Weapon TV show will be renewed for a fourth season? How would you feel if FOX cancelled this TV series, instead? Lethal Weapon: Season Four; Would Damon Wayans Return to the FOX Series? Lethal Weapon: FOX Orders Two More Episodes; Is Damon Wayans Still Leaving? Lethal Weapon: Is the FOX TV Series Cancelled or Renewed for Season Three? Lethal Weapon: Season Three Renewal or Cancelled Over Star’s Behavior? Lethal Weapon: Cancelled or Renewed for Season Two on FOX? i got tired of wayans. would like them to partner wesley and clayne together. both special trained and both a mess. they would work well together. claynes learned his lesson. it could still be a good show. Renew Please! Loved all 3 seasons! I stopped watching when they killed off Clayne at the end of Season 2. For me, the show was ruined. Cancel it. It stinks without Clayne. I love Lethal Weapon. And the season 3 finale was incredible. It set up the next season really well and left me wanting more. Character development is excellent. Love Wayan. I enthusiastically vote for a new season. I like the direction the show has taken its a lot more interesting and fun to watch. I hope There aren’t anymore cast changes because the casting is perfect the relationship between the characters is really great. I hope there is a fourth season and beyond with the current cast I love the new characters and how they blend so well with the olde characters. I hope Mr Wayans doesn’t leave the show cause that would be tragic. Please do not cancel Lethal Weapon! Season 3 was the best season yet!! Love Sean William Scott replacement. I look forward to this show every week. It has everything!! Please renew lethal weapon. It’s awesome. Adventure, edge of your seat, humor, it has it all. Cole is the perfect replacement. I never miss it and research episodes over and over. Damien is the best, really enjoy him. Please keep the show. Please do not cancel. It has been up against NCIS. Not fair to anyone. I always tape. Wonder if those in charge regret killing off Riggs? Love this show! Season 3 was the best yet! Bring on Season 4 PLEASE!!!!! We love the show ! This is the first season we have watched & would hate to see it end ! !